The FLIR A310 pt pan/tilt has all the necessary features and functions to build single- or multi-camera solutions. The FLIR A310 pt can pan +/- 360º continuous and tilt +/- 45º. It is ideal to cover large areas. Typical application examples are coal pile, waste bunker and substation monitoring, utilizing standard Ethernet hardware and software protocols. 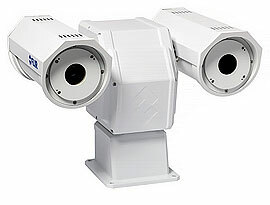 The FLIR A310 pt is a multi-sensor and includes a lowlight 36x zoom color CCD camera. FLIR A310 pt contains an uncooled Vanadium Oxide (VOx) microbolometer detector. It produces crisp thermal images of 320 x 240 pixels and makes temperature differences as small as 50 mK clearly visible. It comes with a built-in 25 degree lens with motorized focus. MPEG-4 streamed video output over Ethernet to show live images on a PC, and 640 x 480 with overlay up to 30 Hz. Composite video outputs, PAL and NTSC compatible are available. Both cameras can be controlled remotely over the Web and TCP/IP protocol.